I can't believe it's been 100 posts already! When I started this blog, I was looking for a way to put all of my recipes on the computer so that my children could access them easily. One of my sons was looking at a software program to do this and the older son and his wife were calling weekly to get instructions on how to cook certain dishes that my son loves. They still do that some of course, but this blog has helped them out as well. It saves them a little time if they can pull up a recipe on the computer! Of course, I still have recipes to add! This blog has also introduced me to some wonderful people! I've enjoyed getting to know so many of you wonderful bloggers and a number of you have helped me when I was stumped on something technical! I was definitely not teck savvy when I started this, other than Ebay and email! Of course, I'm still struggling in some areas, but I've gotten better! I love your comments; they bring a smile to my face! I've even become a better cook as I've learned so much from your wonderful blogs! I also have a lot of recipes to try, so my family is happy because they have more variety now in our meals. Of course, I'm also taking pictures before they can eat, so they had to get used to that! And, I take a lot of pictures! But, they've gotten some better too, except for the one above, it turned out not so great. But it was the best one, so sorry about that. So anyway, I'm having a giveaway to show my appreciation to you, my readers. Unfortunately, I can only offer this to my readers in the U.S. I wish I could do it world wide as I appreciate all of my readers, so maybe next time. 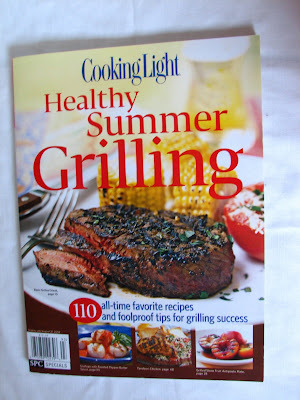 Up for grabs is a special edition of, "Cooking Light, Healthy Summer Grilling", cookbook. There are no ads, just 110 delicious looking recipes for every level of experience. It includes recipes for beef and lamb, pork and poultry, fish and shellfish and fruits and vegetables! The "Adobe Marinated Pork Tenderloin and Grilled Pineapple Salsa", that I last posted, is from this book. Every recipe looks fantastic! There are steaks, sandwiches, kabobs, tuna, clams, swordfish and lots of other choices! So to enter this giveaway, you must be from the U.S., and you need to leave a comment telling me what your favorite grilled food is. This contest is open until Saturday evening at 12:00 midnight. I will announce the winner Monday morning, August 10th! Winner will be chosen randomly. Thank you everyone for a great blogging experience! Happy 100th post! The marinated pork tenderloin sounds great! Congrats on your 100th post! I think recently ribs have been my favorite thing to put on the grill. There's also kielbasi, sausage, potatoes and....well, I can't really pick just one! Congrats, time does fly doesn't it in the blogging world! My favorite grilled item is corn! My favorite grilled food is marinaded chicken. Happy 100th! I love grilled chicken. Great giveaway! Congratulations on your 100th post!!!!! Your recipes always look delicious! As for my favorite grilled recipe...it would have to be a toss up between that smoked sausage dish I posted with the peppers and onions or just a good medium rare steak! Congrats on reaching 100! Your recipes and photos are always appetizing. I think my favorite grilled foods are pizza and kabobs! I'm so excited you have 100 posts under your belt! Congrats :) I enjoy reading each of your posts. I've made some great recipes from your blog with many more I want to make. It's good to hear your family has to wait on the food to get photographed before they can eat it too! I love most anything grilled. I really enjoy grilled pork chops or steak and I love grilled potatoes. The list can go on and on! Congratulations on your 100th post! I started my blog for a similar reason. The cookbook looks terrific! Congrats! It is an experience isn't it? Can't wait to see your next hundred!! Happy 100th post. Yay for you. Your tea, your blackberry scones, your blueberry crumble (having a berry week). It's a lovely recipe box, Lynda! Happy 100th post. What a great giveaway! My favorite grilled items are grilled veggies, especially portabellos and peppers. Also love love love grilled peaches! congrats for you 100th post! Congrats to you! Keep the great posts coming! Congratulations! i'm partial to steak grilled medium rare!